I really enjoy miso cod. I love the taste and the texture. I’d even go so far as to say that it’s one of my favorite dishes. Despite my preference for it though, it’s one of the very few things that I adamantly refuse to order in restaurants. I know that sounds odd. But I don’t see the point of paying good money–heck, usually a lot of money–for a dish that’s ridiculously easy to replicate perfectly at home. It’s one thing to go to a fancy restaurant and be totally wowed by amazing things that you’d never, no matter how many cookbooks you read or cooking classes you take, be able to make. It’s another to go somewhere and order something you could put together in minutes, blindfolded. A lot of good restaurants around the world serve miso cod. Many claim it as as a signature dish. You can get it most famously in any number of Nobu restaurants around the world. Nobu charges US$17 for a portion. In Singapore, restaurants charge almost the same. The ingredient cost of a portion, however, (at least here in Singapore) is somewhere between US$6-US$7. That’s a 150% mark-up. Which is understandable. When you pay for a dish in a restaurant, you’re not just paying for the food. You’re paying for the labor costs that went into turning the raw ingredients into something delicious; you’re paying for the service staff that so politely took your order and then brought you your food; and you’re helping to pay for the restaurant’s rent and utilities. Even though I understand all of this, because miso cod is so easy to make, I have a real problem accepting it. Preparing miso cod is as easy as making Jell-O. You only need to be able to do three things. First, you need to be able to measure ingredients. Secondly, you need to be able to turn on your oven. And lastly, you need to be able use a watch. It’s that simple. And it’s pretty foolproof. Over the weekend, I noticed that my favorite Japanese supermarket has begun stocking a whole range of yuzu-flavored products. Inspired, we bought some yuzu pepper sauce and some yuzu miso paste. I used the yuzu miso, mixed with some shiro (white) miso, to marinate two lovely pieces of black cod. With the cod, we served some butter braised leeks. It was a lovely meal, worthy of any restaurant menu, but at a fraction of the cost. Bring a little sake and the mirin to a boil in a medium saucepan over high heat. Boil for 20 seconds then turn off the heat. Let the mirin-sake mix cool to room temperature. When cool, mix in the miso paste and the sugar. Pat the filets dry with paper towel. In a shallow bowl, cover the filets with the miso paste mixture. Cover the bowl with plastic wrap and leave it in the fridge for 2 to 3 days. The day you want to eat, remove the cod from the fridge 2- 3 hours ahead of cooking. Preheat your oven to 200ºC (400ºF). Wipe the miso off the cod (do not wash or rinse it) and place on a baking tray. First place the fish on the grill, or in a broiler pan, and grill or broil until the surface and skin begins to brown. Then bake for 10-12 minutes. That’s it! 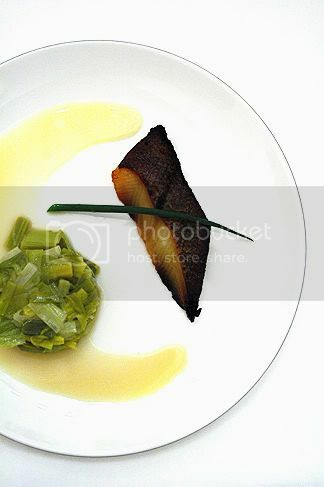 Love miso cod too – made it once with a much simpler recipe using just red miso but my hubby doesn’t think much of it. Will definitely try yours soon! 🙂 Tried your valentine’s day salmon recipe too -was delicious! But what do I do with the leftover shiso-hijiki? Any other recipes to share? I can’t exactly say what, but there’s something about that photo that makes it unusual.. a tad ‘unrealistic’,like a painting of some sort. Did you also try to copy the presentation from Nobu? Perhaps you should get a bigger fillet from a real fishmonger than using those from the supermarket…it is kinda small and charred too. Nice try though! wow, i didn’t know miso cod was so easy to make! i will definitely be trying this at home ~ thanks for sharing! Nicholas: I love mirin. It’s great in so many things. Melt some butter, add a bit of soy sauce and mirin, and that’s a great sauce for sauteeing everything from veggies to seafood. Anonymous: Usually Meidiya at Liang Court. Sometimes Isetan. Anonymous: Don’t forget the fish is covered in a marinade. It’s fine. Just make sure the fish is fresh to begin with. MM: Thanks. Do you also use Nobu’s recipe? Gastrochick: Thanks. I hope you make it. Goes great with everything from mashed potatoes to soba. Su: I’ve found if you use just plain miso, the taste is too strong. That’s why the mirin and sugar help. Also, red miso is very, very strong whereas white is sweeter and more subtle. You can chop up the leftover hijiki and toss it in a bowl of rice. That’s a great way to use it up. Frederico: Heh heh… I kind of liked the surreal quality of the picture. I will admit I pushed the whites in the photo a little white than normal. Hey Chubby Hubby, yes I use Nobu’s recipe. The first time I saw the recipe I was in shock that it was so simple. I’d expected some kind of El Bulli-type environment and equipment to reproduce the fabulous cod dish! But I never produce such a good looking miso cod as you. Your presentation, plating and photography are amazing. The fish goes into the freezer or the fridge? B’cos you mentioned fridge, but have to leave it out for 2hrs before cooking.. makes me wonder. Looks divine! Will definitely try. Zara’s mama: The amount of time the fish needs between the fridge and the oven is slightly arbitrary. My fridge tends to be really cold, so I need to ensure that the fish is not too chilled when I pop it in the oven. Basically, you don’t want the fish too cold when it goes in. Depending where you are and your fridge, this could take 20 minutes or 2 hours. I enjoy your blog immemsely… thanks for going through the trouble. Thanks for commenting on my blog! I love your photos so very much. My husband and I click through both of your flikr books. Just beautiful. I will try the cod! Very nice recipe and marinade. Excited to try! I love black cod and the first time I had it was at Roy’s in Chicago. Amazing fish, isn’t it! How much sake do you use? I got a nice marinade recipe from a local Cambodian restaurant where they use mushroom soy sauce for the marinade. A great choice too. a kitchen newbie question… where would you recommend getting the cod from? When I get mine from places like Cold Storage, they have already been thawed from frozen and we’re supposed to eat them within 2-3 days. So, after marinating in fridge for 2-3 days, erm, is it still ok?? ooops. realised you’ve already answered my very question in the string of comments. apologies. The other problem is that seriously fresh cod is hard to find in Singapore. Even at the wet market, they sell frozen cod. So your best bet is to go where you’re likely to find cod stored properly and where lots of people tend to buy it so you don’t end up with a piece that they received a month ago. Hi CH, I’ve been thinking about getting his book (second one, I wasn’t grabbed by the first one) – I could just buy Japanese books but just can’t get authentic ingredients here and since I don’t like trying the dishes with ‘not the best’ ingredients (which Japanese cooking is all about…), I tend to end up using Japanese ‘inspired’ recipes. I enjoy them too, though. Your cod looks really beautiful. I love cooking miso glazed everything. Miso glazed pork loin is also delicious on the grill. Serve it up with some scallion noodles and some stir-fried kale and you are good to go! Elaine: Thanks. Your blog’s really awesome too. Glad to have you drop by. Bea: Actually, I only use a splash of sake. Much, much less compared to the mirin. The great thing, of course, is drinking the sake once the bottle’s been opened. Keiko: You know we’re so jealous that you can read the vast number of beautiful cookbooks and food magazines that seem to be only in Japanese? We’ll stand in Kinokuniya and sigh, gazing at these beautiful publications that we can’t understand. Loren: This is a good starter. Spots: Yum. I like a good teriyaki too. Scott: Thanks for dropping by. I love your site, especially as S and I are about to embark on building our own home. I also love the idea of using pork loin. Pork is easily my favorite meat. What’s mirin and where do I get some? I don’t get it. I’m looking at the picture up the top, but I don’t see any food. I see some garnish and a small black leather looking thing, but no food.